The new Honda Activa 125 has a BS-IV compliant powertrain and gets new features including auto headlamp on (AHO), LED position lamps and a mobile charging socket. 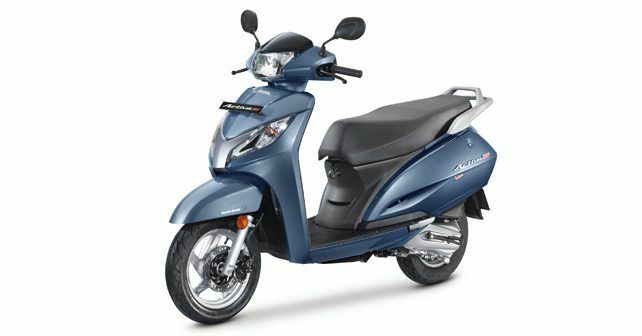 Honda two-wheelers India has launched the new Activa 125 in the market. The refreshed version brings along a couple of exterior changes over the outgoing model, but more importantly, it now meets BS-IV norms and comes with auto headlamp on (AHO) feature. There’s also a new mid variant added to the line-up that offers a combo of alloy wheels and drum brakes. Prices of the new Activa 125 start at Rs 56,954 and go up to Rs 61,362 (ex-showroom, New Delhi). On the outside, the new Activa 125 sports a redesigned front end, featuring a pair of LED position lights integrated on either side of the chrome on the front apron. Apart from that, the new scooter is largely unchanged from the previous model. As for the equipment and new features, you now get a mobile charging socket with the scooter. There are five exterior shades to choose from, namely - Mat Crust Metallic (new), Pearl Amazing White, Midnight Blue Metallic, Black and Rebel Red Metallic. Powering the scooter is the same 125cc single-cylinder engine as before. It develops 8.52bhp at 6,500rpm and 10.54Nm at 5,000rpm, paired to a CVT automatic gearbox. The engine is now BS-IV compliant. That’s because, starting April 2017, it will be mandatory for all new two-wheelers to meet BS-IV norms. Also compulsory for all new two-wheelers is AHO feature. Honda claims that the new Activa 125 is the first scooter in the Indian market to have met both the requirements beforehand. In addition to that, the scooter will now come fitted with Combi Brake System (CBS) as standard. For the uninformed, the CBS applies brakes on both the wheels simultaneously when either of the brake lever – front or rear- is depressed. Honda also says that based on the feedback received from its customers, the company has now added a mid-variant – alloy wheels with drum brakes – to the range. Earlier the scooter was only available in two variants – Steel wheels/drum and alloy wheels/disc. The Honda Activa 125 competes with the Suzuki Access 125 in the market.